t*rexes and tiaras: Stir it up Sunday.. 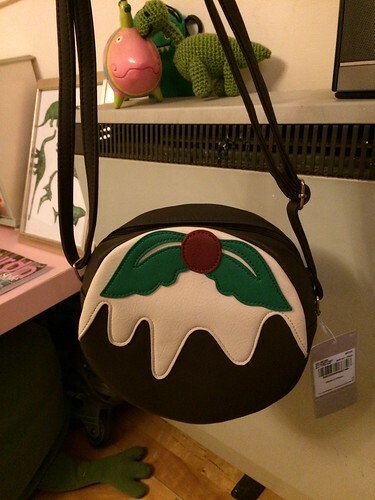 I'm really not a fan of Christmas but I am a fan of a cute bag. This was a chance find in Sainsbury's a couple of weeks back. I'd popped in for something else entirely. I always think it's a shame that they don't have a website which you can buy from, but it's sometimes worth checking in-store for cute things like this. Too cute and zero calories too! Haha, yes - it's better than the real thing! It's such a shame they don't sell online. That's cute. Yeah I thought the lack of website is a missed opportunity...we don't have a Sainsburys near here, so I never know what I'm missing I suppose! That's true - now that I've moved workplace I don't go anywhere near as often, so I don't see what's in store and what's not. Hopefully it will still be around!